Cooperate to survive.... Betray to win! Don't trust anyone! In your small group of adventurers, you have a tradition: after looting a dungeon, you share the loot by spreading all the treasures collected. The one who has dealt the most fatal blows chooses first. Yesterday was fun. Even funny. Today no more at all! Today you have crossed the Coupegorge Dungeon and discovered the Artifact of the Ultimate, the most powerful magical object in the universe, the source of all wealth, all power... You want to seize it at all costs, your little companions too. You're going to have to kill more monsters than they do. You don't have to be the one who hits them the most, just the one who finishes them off! And once you're out, the Ultimate Artifact is yours! Yes, but you have to get out of the dungeon already. And for that you still need them... Anyway... for the moment. 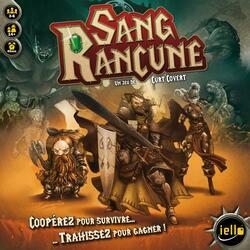 Sang Rancune is a more or less cooperative game where to win, you will have to highlight your sense of betrayal, your taste for deceit and your art of the low blow.